A Summer wedding in an industrial warehouse space, a gorgeous BHLDN gown, a flower crown that is to die for, and PIZZA FOR DINNER?? Hell yes please and thank you. Rain and Tracy met through mutual friends, and embodied a lot of their local Durham connections for their wedding- Raina is the product facilitator at Union Hair Studio (and look at her hair, holy cow right?) 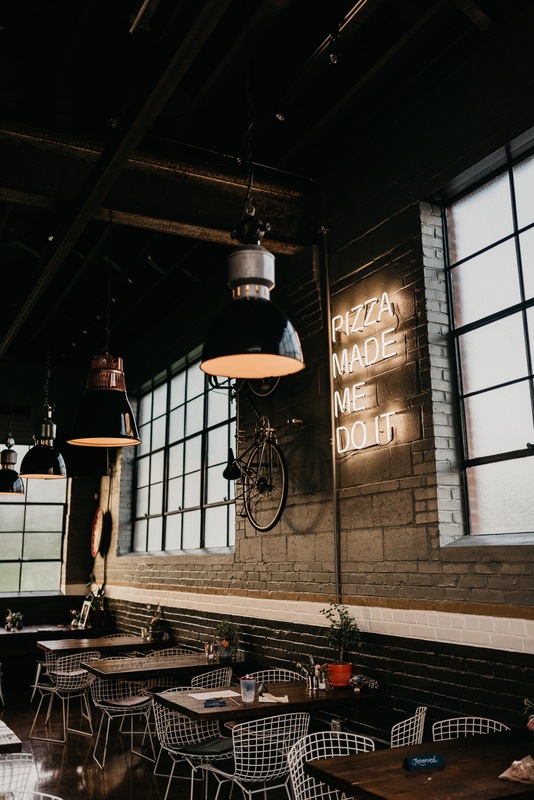 and Tracy is part owner of Hutchins Garage- a stylish new bar and pizza joint that you should go eat at right now before finishing this blog post. Seriously, go. I’ll wait. So of course we all got to eat delicious pizza, and enjoy the Rice Krispies Treat cake (also featuring fruity pebbles and cocoa krispies) from The Cupcake Shoppe in Raleigh. Raina even grew some of the plants and greenery used in the ceremony and reception space- I’m still jealous of that green thumb. You can find this wedding featured in the September 2018 issue of Durham Magazine.